Wah Taj! Is Kerala Tourism Trolling Yogi Adityanath Government? The CPM-led Kerala government has been engaged in a game of political oneupmanship with Yogi Adityanath ever since he recently visited the southern state for a rally against political killings. Thiruvananthapuram/Lucknow: Kerala's Tourism Department has "saluted" the Taj Mahal for "inspiring millions to discover India" in what many see as an attempt by a government wing of the Left-run state to troll the Yogi Adityanath government. The unprecedented acknowledgment comes at a time the Uttar Pradesh government is under criticism for leaving the Mughal-era monument out of its tourism booklet and various voices of the ruling BJP are calling it a "blot on Indian culture". The post was shared both on the official Facebook and Twitter handles of the Kerala Tourism and reads: "God's Own Country salutes the #TajMahal for inspiring millions to discover India. #incredibleindia." Taj Mahal, India's most recognisable tourist landmark, was surprisingly left out of UP's recent tourism booklet 'Uttar Pradesh Paryatan-Apaar Sambhavnayen' which listed all other tourist spots in the state. The monument is marvelled as one of the Seven Wonders of the World' and was designated a UNESCO World Heritage Site in 1983 for being 'the jewel of Muslim art in India'. UP government's omission synchronised with hardliners from the ruling BJP - MP Vinay Katiyar and MLA Sangeet Som - claiming the mausoleum was built by Mughals over a Shiva Temple 'Tejo Mahalaya' and that its patron, Emperor Shahjahan, had targeted many Hindus during his rule in the 17th century. They were quickly put down by Chief Minister Adityanath who said "it was built by the sweat and blood of the sons of Bharat Mata" and indirectly by Prime Minister Narendra Modi who called for pride in one's heritage and history. 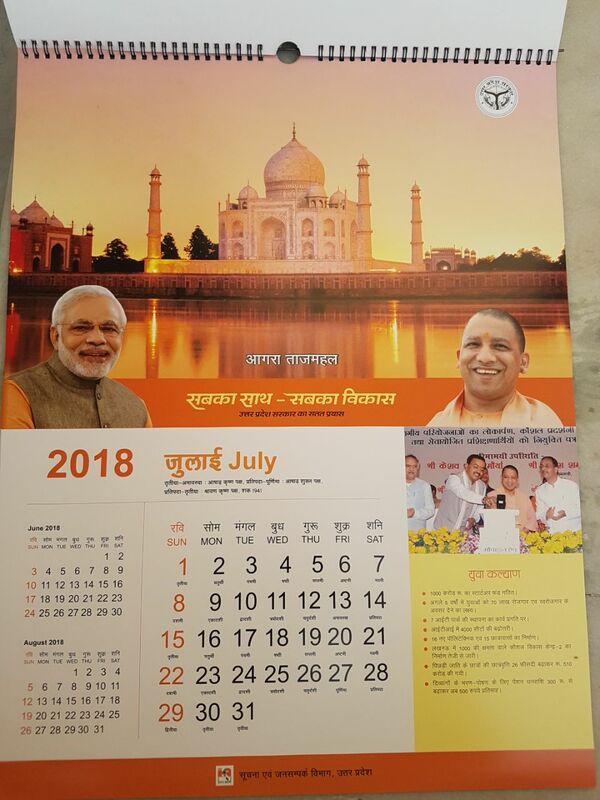 The UP government also published a heritage calendar this Wednesday - an exercise normally done every January - featuring the Taj in the month of July alongside pictures of PM Modi and CM Adityanath. The CPM-led Kerala government has been engaged in a game of political oneupmanship with Yogi Adityanath ever since he recently visited the southern state for a rally against political killings, and in its wake had questioned its human development indices seen as comparable to that of European countries. The Left then hit back questioning the Adityanath government's record in public healthcare and communal amity. The personal handle of CM Pinarayi Vijayan on October 4 tweeted out - in Hindi - a gentle reminder to Adityanath on the Taj controversy. In the background of such political animus, the significance of Kerala Tourism's tweet was not lost.